In August 2016, an announcement got released that the Rio Olympic pool had gotten shut down amidst claims that the pool had turned green. Many were surprised at the statement, curious as to what could have gone wrong to lead to such a drastic measure. This shut-down came after some of the contestants as well as their managers had questioned the safety of the water given its apparent change in color. The organizers had been quick to assure them that the color change would in no way affect their safety. However, this reassurance did not augur well with all stakeholders in the coming days. The closing down of the pool led to some reactions. Some people such as Tom Daley felt that the closure might mean that their health was at risk given that they had been in contact with the water. He stated in a tweet that he would not use the pool and wondered if other athletes were in danger as a result of the color changes. Waterpolo players were some of the most vocal athletes in the matter. Much of their activities require them to have good vision while in the water. They claimed that the green color rendered them unable to see the objects in the water. It hurt their eyes and made navigation hard. The surprising fact is that the water was in excellent condition when the athletes first arrived at the diving arena. It was its usual bright blue shade which allows swimmers to see while immersed in the water and enables spectators to watch as the athletes make their way to the ends of the pool. As of Tuesday evening which was just a couple of days later, the water had changed its color from blue to a very dark green. The neighboring swimming pool that got mainly used for diving had done the same thing a few days earlier, and this caused worry amongst the athletes. One of the contestants in the water polo activities opened up about his experience in the green pool. Tony Azevedo stated that it was quite hard for him to open his eyes while in the water due to the discomfort and when he could open them, it was hard to see. In spite of all the difficulties, he managed to emerge the winner. He felt that there were too many chemicals in the water and given that they were competing in Olympic Games, such practices were not prudent. Things got worse when it came to synchronized swimming where each move requires being in full view of the audience. Imagine watching people practice this kind of diving when you can barely make out their features in the pool. Even worse, put yourself in the position of a synchronized swimmer who somehow has to keep their eyes open in water that hurts them. The women’s synchronized diving final faced all these problems, and there was fear that the event could not get completed. Other contestants came out to say that chlorine was not the only factor in play when it came to the color changes. Such athletes included Gergo Zalanki whose eyes were affected by the pool water. He said that in Hungary, many people used a lot of chlorine in the water and yet his eyes had not experienced the effects he felt in Rio. As such, he had a suspicion that there was more to the matter. Everyone had an opinion on the matter with some stating that the color changes were due to urine. Others stated that the color alterations were due to algae. 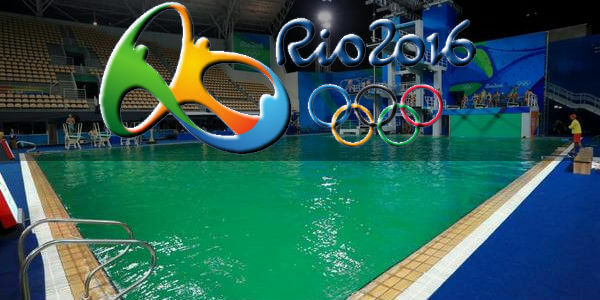 Others claimed that it was an elaborate plan by the Brazilian government to have their flag colors in the pool. Different causes got explored, and the water got tested in the lab. Results showed that the water in the swimming pools was safe for use in swimming and that no harm would come to those who had swum in it. The organizers of the event stressed on the fact that the water was suitable for swimming and that all contestants had no cause for worry. It is such situations that show us how critical the quality of water is and how much effect it has on our lives. In this case, it led to the shut-down of an Olympic Pool.